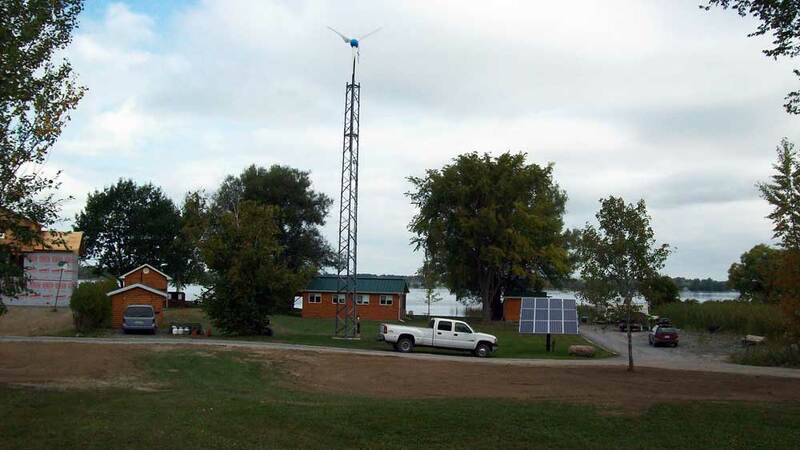 Off-Grid Systems – Quantum Renewable Energy Inc.
Off-grid systems are stand alone systems that are not connected to the utility power grid. At Quantum, we customize our off-grid systems so that they can always meet the needs of the customer. Projects range in size from simple livestock water pumping station to large systems capable of supplying electrical power to a home or commercial building. Solar module: A series of silicon cells that are covered by a sheet of protective tempered glass. Through the PV effect, these cells convert solar radiation into DC electricity. A PV array consists of a number of modules strung together electrically. Charge controller: An electronic device that regulates the charge going into the battery bank. Some charge controllers come with added features such as digital displays, maximum power point trackers (MPPTs), and low voltage disconnects. Battery bank: Stores the energy produced by your solar array for future use. The battery bank can be as small as two batteries or much larger depending on the size of the electrical load. Inverter: An electronic device that converts DC power into household AC electricity. Generator: A backup generator is usually required for larger, off-grid systems. In Ontario we get 6 times as much sun in June as we do in December, so a year round off-grid system requires some generator battery charging in the depths of winter. 1. The solar modules convert solar radiation into DC electricity. 2. The electricity runs through the wires to a charge controller. 3. The charge controller stores the energy in the battery bank, and protects the batteries from over-charging. 4. The batteries can now send power to DC loads (12-48V) or send it though an inverter to power common household appliances (120 or 240 VAC). How long should my off-grid system last? The standard lifetime of a system is 20 to 25 years; however, with proper maintenance it can easily surpass this. How much will my off-grid system cost? Cost ranges depending on the size and complexity of the system. Small cottage systems can start at as low as $4000. Please visit our Site Evaluation page if you would like a firm quote. What are the maintenance requirements for my off-grid system? Service requirements vary depending on the type of system. Lead acid battery systems require regular monitoring, at minimum on an annual basis. Service visits are available at a cost of $75 per visit. How long does it take to complete the installation? The typical cottage system takes one days; installation time for residential systems varies depending on the size of the residence. All of our systems carry a complete two year warranty on labour. Equipment warranties vary from supplier to supplier. A 25% deposit is taken at the start of installation, with the balance due within 30 days. How large will I need my off-grid system to be? The size of the system depends on the size and number of electrical loads you want to power. You can fill our Load Analysis worksheet to help determine the size required.